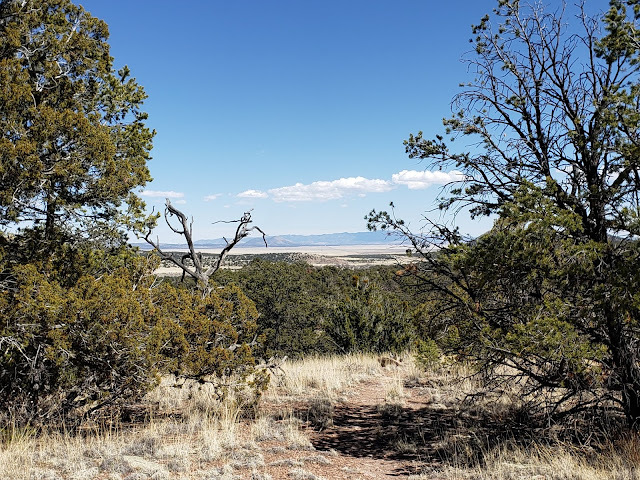 Jan and I headed up Route 25 from Caballo Lake to Socorro, New Mexico. We were happy to discover a picturesque town square and a very modern laundromat. Great!! 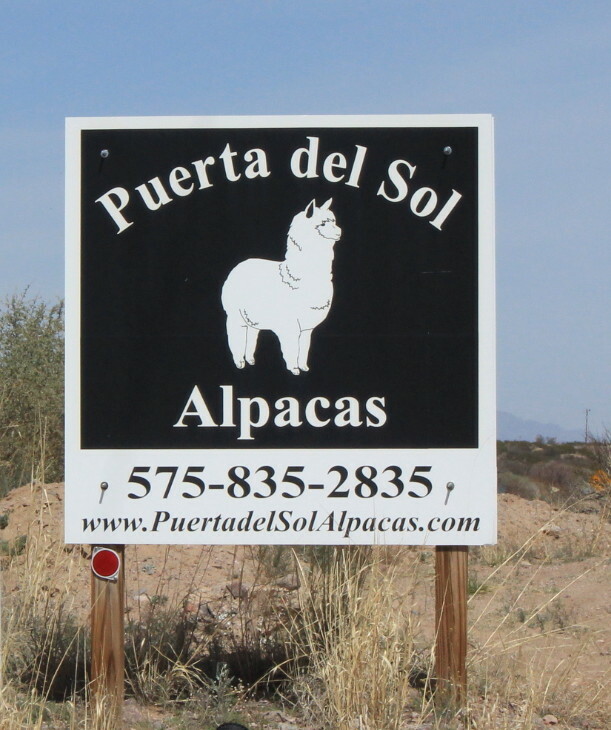 From there we headed over to Puerta del Sol Alpaca farm. As members of Harvest Hosts, we pay $40 per year to be able to stop at all kinds of farms across the U.S. Apple orchards, vegetable farms, wineries, as well as various restaurants, museums, and more. Members can call ahead and stay overnight--sometimes a parking lot---sometimes a wonderful view from inside a field of grapevines. 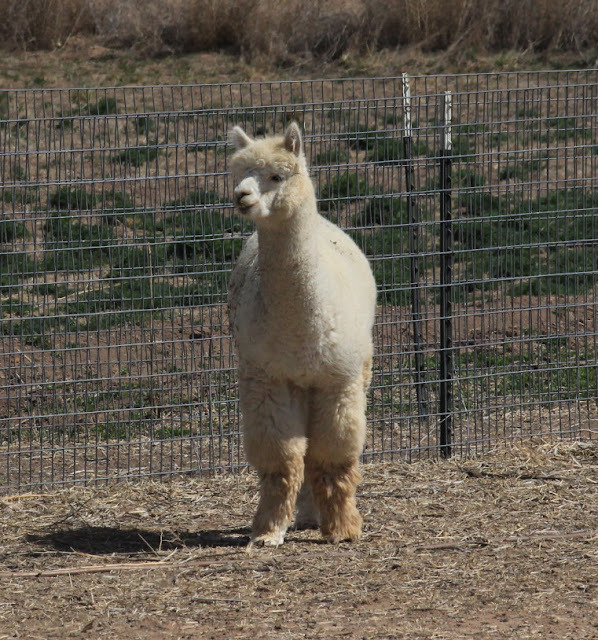 This time, we get to see a good variety of Alpacas. 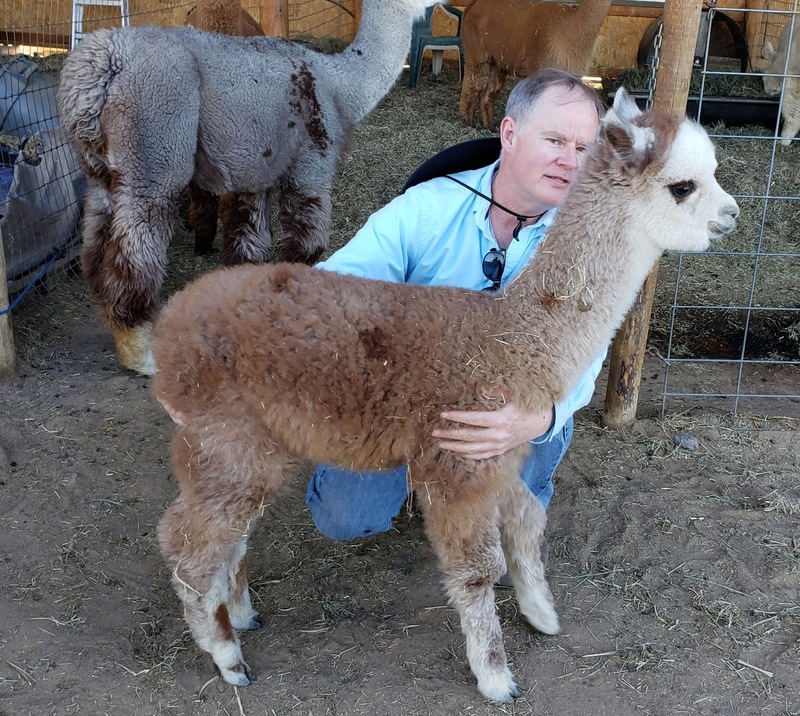 Dave, the owner, is here with one of the younger Alpacas. 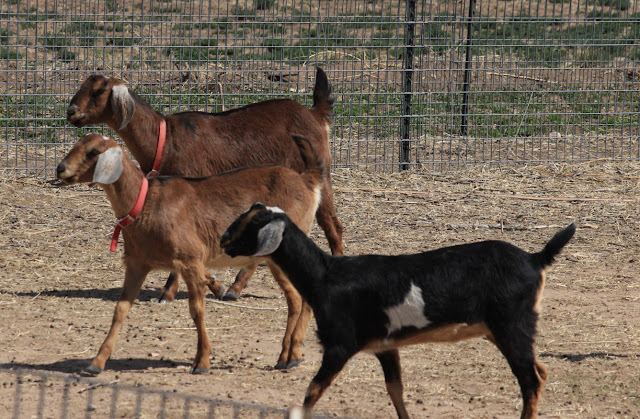 Dave said that it took a while, but he discovered that the right kind of goats could take care of all the weeds on the property. At the same time the right kind would also leave important vegetation alone. In a few more weeks it will be time to shear the fiber off in blankets. 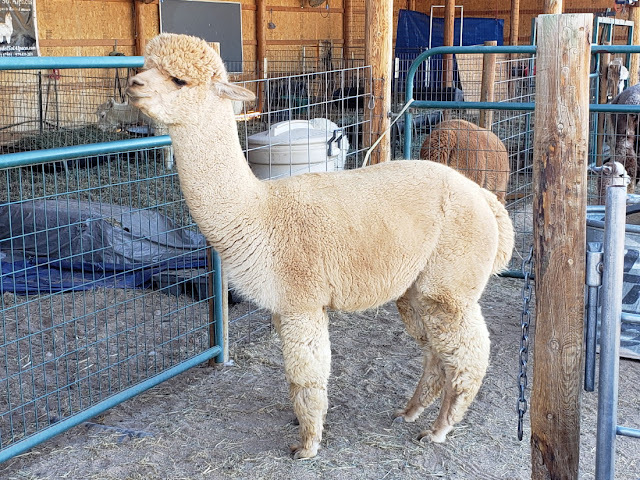 The Alpacas will be happier because the temperature then will be starting to become quite warm. If you click on the video above(and enlarge), you will see what happens when the gates are opened for the late afternoon meal. We all gathered around the fence to watch. Diego seems to be the king of the ranch. 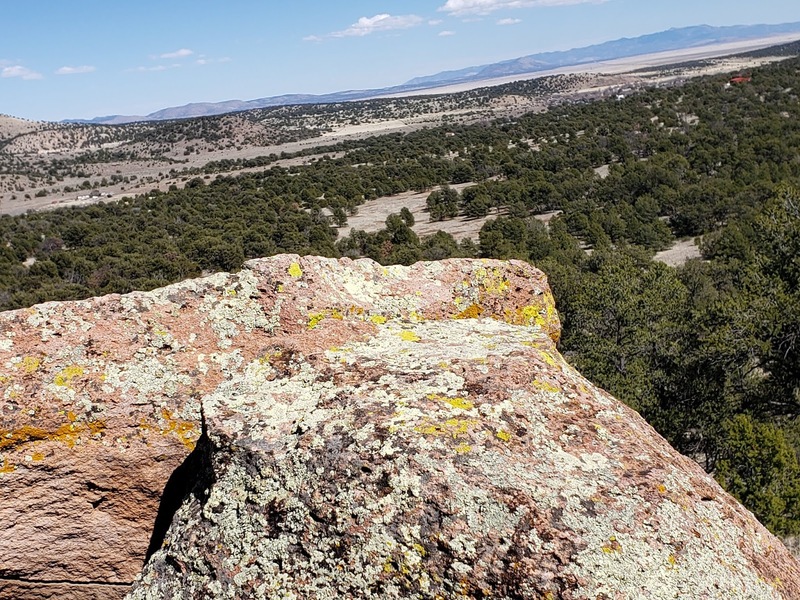 These two pictures are from our visit to Silver City, New Mexico. This is part of an enormous active copper mine that stretches for miles. It is the Chino Open Pit Copper Mine, the oldest active copper mine in the Southwest. The Apaches were the first to find copper that grew from the ground in fernlike pieces hundreds of years ago. The following website offers more information. Back in the 1800's the copper was moved by mule trains. Images of 200 ton trucks. Some of the pictures show how large by placing people in the pictures. Above is a video from our stay at our previous Harvest Host stop-at St. Clair Winery in Deming. Yes, we had snow-one of many days of snow in New Mexico. Leaving Socorro, we head west on Route 60. A very quiet road with nice views and mostly no people. This is one of the ranches that mostly seem to be raising beef cattle. 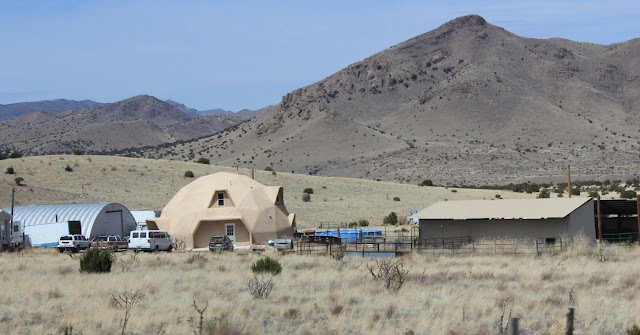 The geodesic dome house caught Jan's eye for a picture. Along the way is the VLA. Yes, we wondered too. What does VLA mean? Well, golly, it means Very Large Array. A very creative name ? Just kidding. This is part of the National Radio Astronomy Observatory. There are 27 antennas arranged in a "y" and the data is the equivalent of an antenna 22 miles across. This first link is to some information on the array. Check the image galleries and more. This following link is for some images from such arrays and their purposes. The array was 50 miles out of Socorro. Another 40 miles or so brings us Datil Well Campground, a Bureau of Land Management campground. Dry camping with no water(they were still renovating)or dump station. Still--- a beautiful place to stay! The price--$2.50 per night with our senior pass. The sites have been mostly leveled with new gravel. There are all new water spigots that will be great when they are opened. There are also new vault toilets that were placed here last year. The elevation here is about 7,400 feet. A nice long hike takes us up through the junipers to some open viewing areas. Those mountains are at least 50 miles away. The Datil Well was one of 15 livestock watering sites on the Magdalena Livestock Driveway established in 1885. 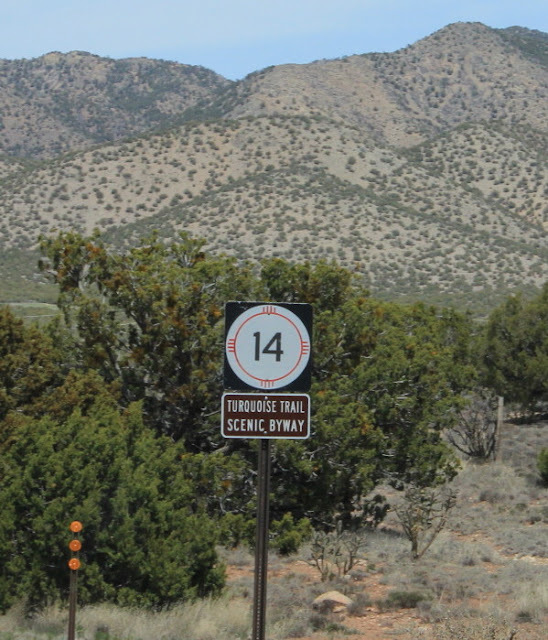 That was a trail that was used to drive livestock from Springer, Arizona to the railroad in Magdalena, New Mexico, about 132 miles. 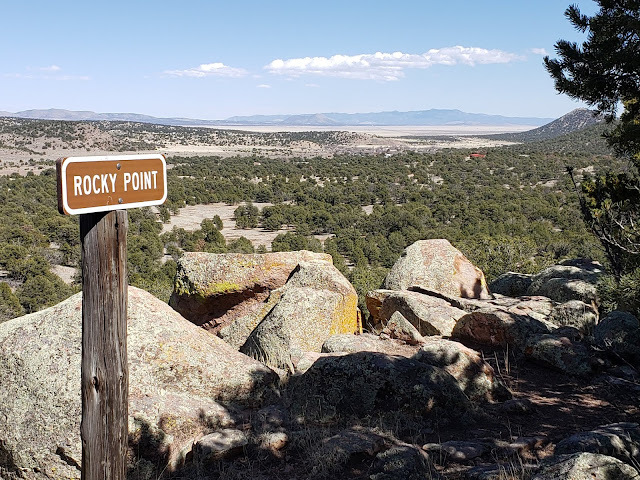 In 1919 alone, over 21,000 cattle and 150,000 sheep passed over this trail. The last drive was in 1960. Don't you wish you could see one of those drives today? The trail shows signs of the local elk population, though none were seen on our hike. There are signs on the highway warning to look out for elk. One other piece of history here. In 1910 the National Highways Association laid out an auto route from coast to coast. The trip was made by Mr. A.L. Westgard. He used established highways from Washington, D.C. to Kansas City. Then followed the Santa Fe Trail to New Mexico. The route passed through here and then north and south to find a pass through to Arizona. Quite exciting in 1910. Lots of colorful lichen on the rocks. Town , some 20 miles west of Datil Well. We first stopped at a very small campground to fill with water and empty our tanks. Then, in this extremely small town, we stopped at Pie-O-Neer which had a very good rating for home made pies. They were absolutely right. A very friendly owner who greets every customer. And there was a large variety of home made pies. 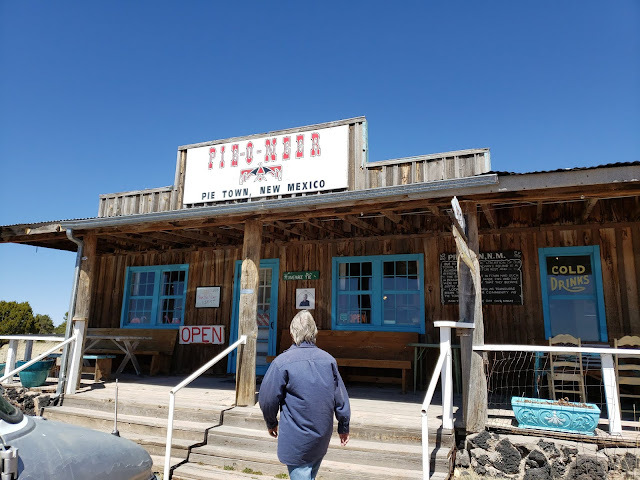 We had a slice of New Mexico apple pie, heated, and with a scoop of vanilla ice cream on top and a cup of great coffee. 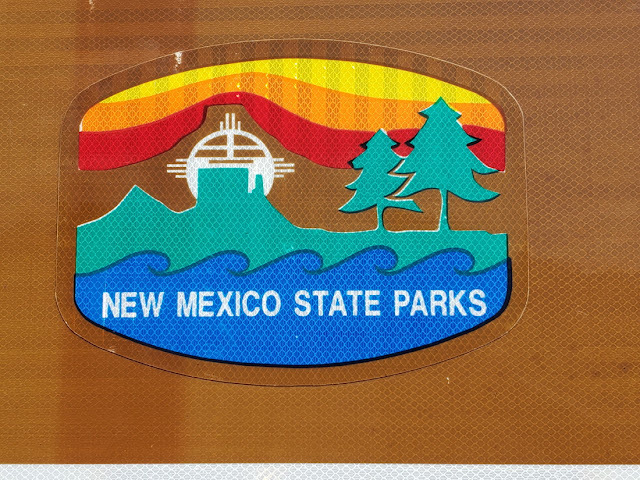 New Mexico apple pie is made with Granny Smith apples and some New Mexico green chiles, and pine nuts that grow in the area. The peppers are mild and add a great flavor to the apples. 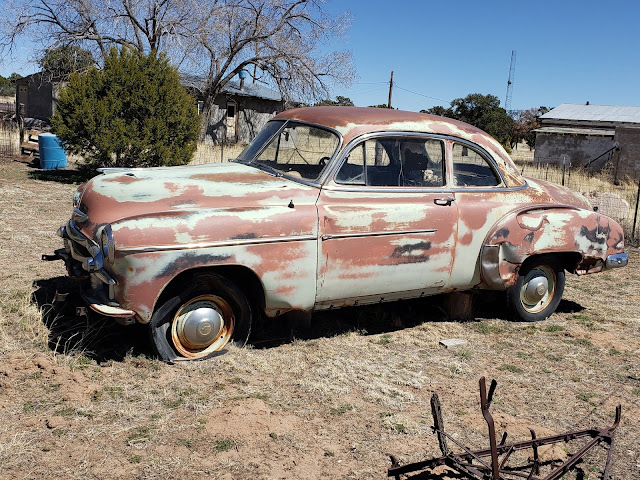 Out in the yard is an old rusted 1951 Chevrolet. Reminded me of my first car. This is my 1951 gem in our back yard. Most cars then were one color. This was a special coupe with white roof and red dashboard. Fender skirts on the back too! 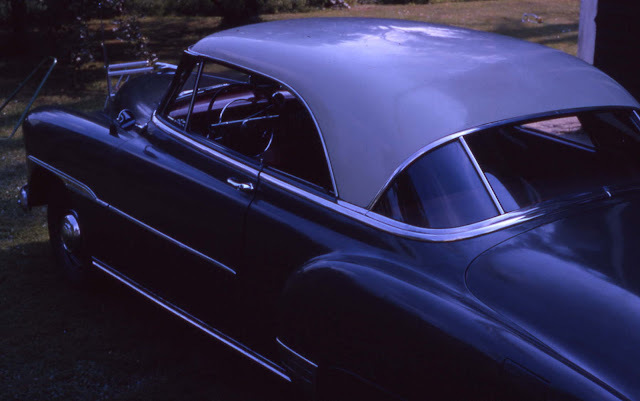 The following link will show a better picture of a similar 1951 Chevy 2 door. I paid $100 for this one in 1962. 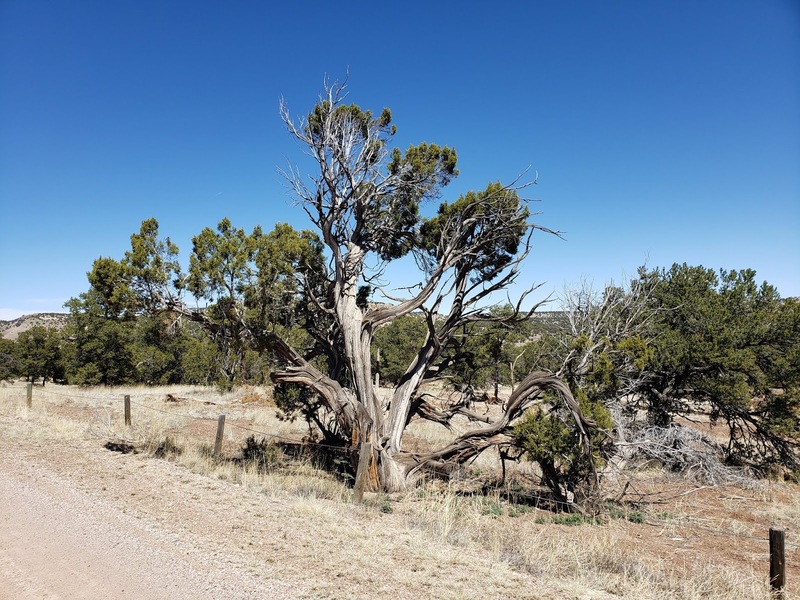 Some of these Junipers were quite old--up to 100 years. This one seed Juniper looks about that old. While we were here there was some severe weather that rolled through. Snow flurries and very cold. So cold that we left our cupboard doors and bathroom doors open so as not to freeze the water pipes. We set the inside furnace for 40 degrees and it came on rather frequently all night long. Getting up before sunrise, the outside thermometer read 12 degrees. 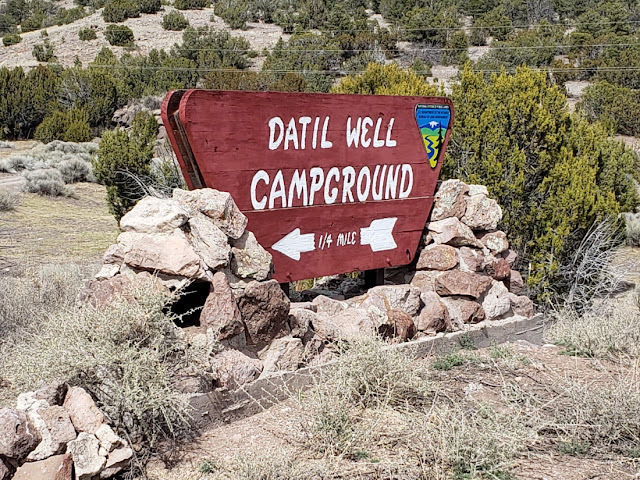 From Datil Well, we head back to Socorro , then north on Route 25, and east again on Route 60 to Manzano Mountains State Park. Yes, that is snow. They had 5 inches of snow on the ground this morning and most had melted. What we didn't realize was the melted water had turned the red dirt, on the steep hill driving up, to red, slippery mud. We had to try the hill twice. And then the tires were caked with heavy red mud and also heavily caked between the dually tires. We got rid of a lot of it, but still have some on the wheel wells and more. A beautiful dry camping site. You can see a line of some of the red mud. There are a few electric and water sites here, but they are mostly reserved far ahead. We are happy with dry camping. the elevation here is 7,600 feet. Jan and I take our time with our hikes and more until we adjust. Across from the site is a large Alligator Juniper tree. All the trees seem to have part of the trunk that looks like it has no bark and then the other half is covered with a bark that looks like alligator skin. They all seem to be in this one spot. I thought this was a gecko, but Jan saw it in these camouflage pine needles and pointed out a kind of lizard. 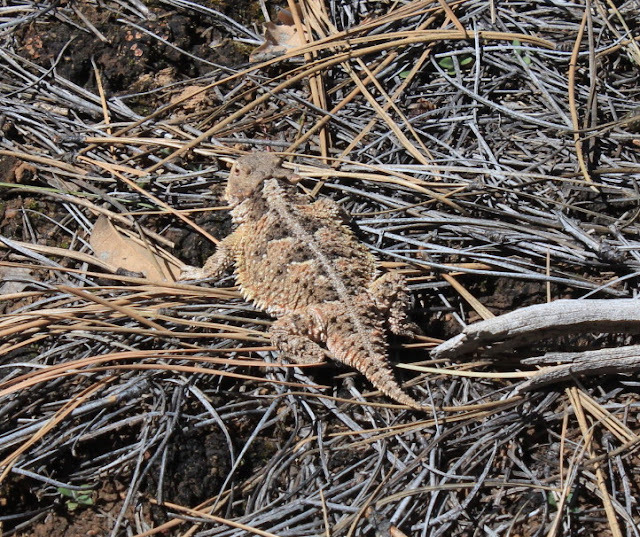 We found an image of a Short Horned Lizard from the area. Basically, we follow Route 60 east through some very open area. Some beef cattle and a very few small towns. Along the way, coming to a hill, is a huge line of wind turbines. Perhaps a hundred or more. Jan caught this one at just the right time, with some sun on the blades and a few wispy clouds. 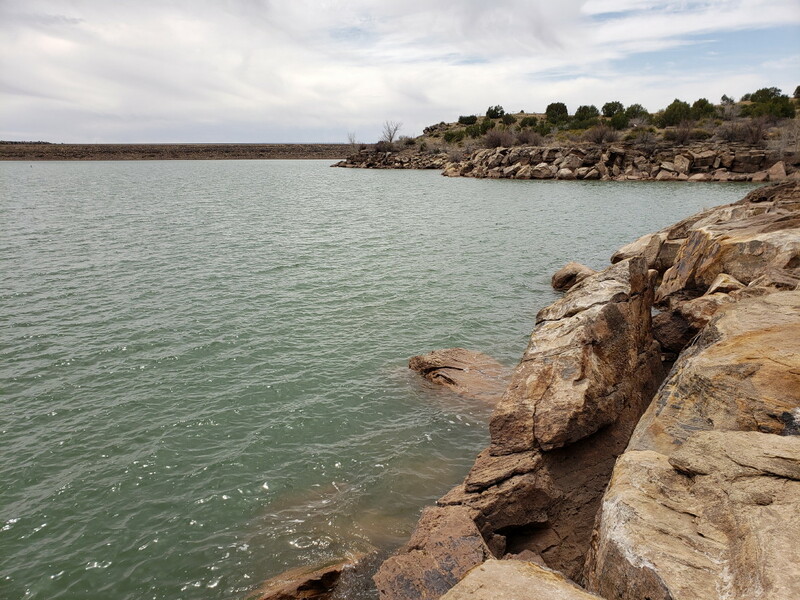 It is surprising to see these reservoirs turn up where you expect nothing but high desert. Sumner Lake was another great stop with a lake view from our site. Enjoying the spot are you????? 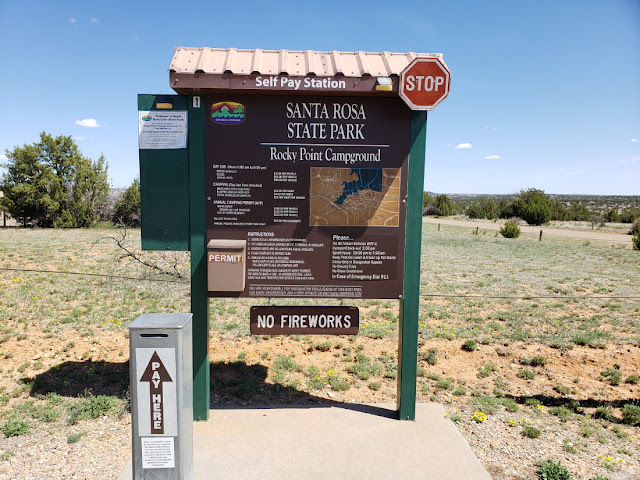 A short trip up Route 84 takes us to Santa Rosa State Park just off Interstate 40. Our typical welcome is a self pay station with that gray tube in front called an "Iron Ranger". Still love the New Mexico State Park logo. Has to be one of the best. A very private site for Lady Blue. No one else around and a great view of the water. 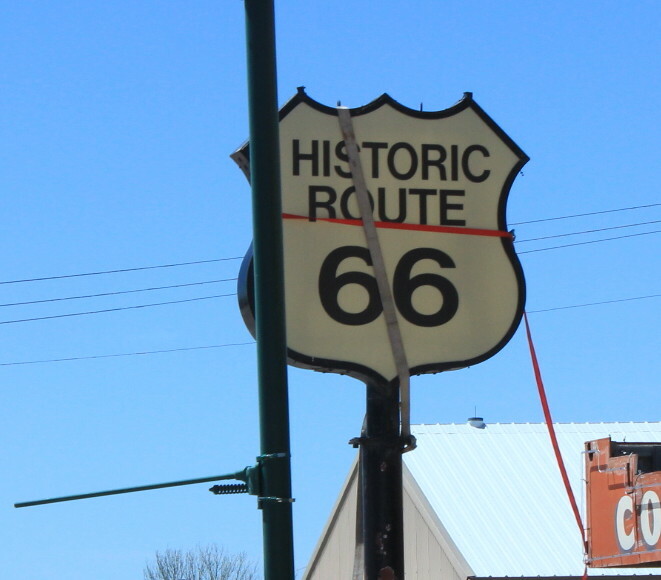 Back into Santa Rosa, we resume our way on historic Route 66. Leaving Santa Rosa, we head towards Albuquerque. 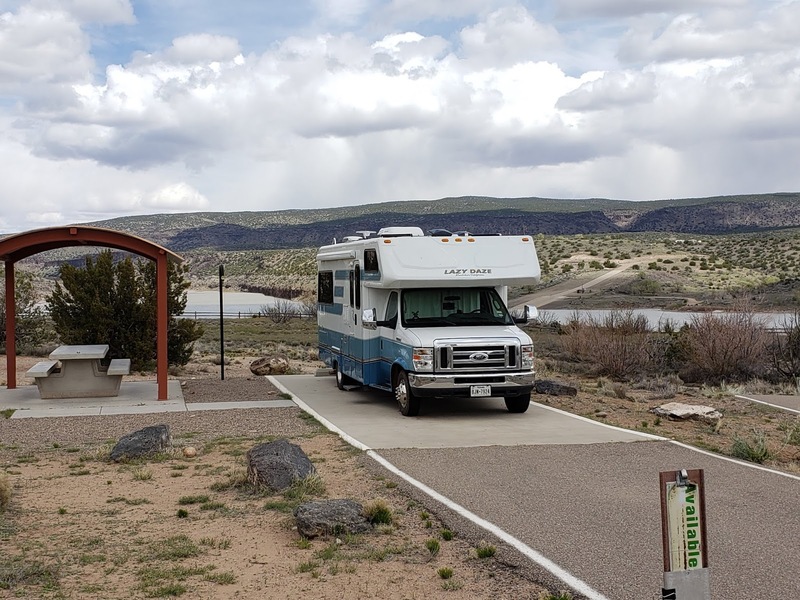 A short one night stay at Happy Trails campground, a Passport America park--half price. Also found out that Happy Trails was originally one of a number of campgrounds formed by TV cowboy Roy Rogers. On our way the next day, it is a very short travel to Route 14 north --the Turquoise Trail Scenic Byway. A few ranches along the way. Actually, you don't see the ranch. You see an entrance with sometimes a metal or a wood engraved overhang. We last stopped in Madrid 6 years ago. It is a very pleasant, quiet artists' town. All kinds of shops offering turquoise, paintings, pottery, carvings, and more. It is also known for one of the locations for a John Travolta movie, Wild Hogs. Scroll down on the site for Madrid pictures. Lots of metal carving on the railing for the deck. Moonbow has some unique wood carvings. Would the gallant knight fit in Lady Blue? Everyone finds a special store. Lisa Conley is the artist owner of Conley Studios. After conversation, we realized that Lisa originally grew up in Concord, Massachusetts----small world! Above is one of our purchases. Can you guess what it is for? Answer at the end of this blog. I had not been able to convince Jan for any recent purchases of jewelry. She was always insisting she had more than she needed. 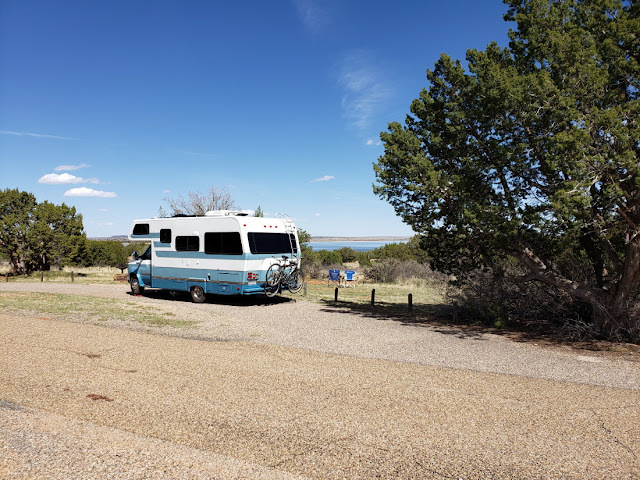 Well, I finally convinced her( not too hard to do here)that there was some very nice turquoise here at Conleys. 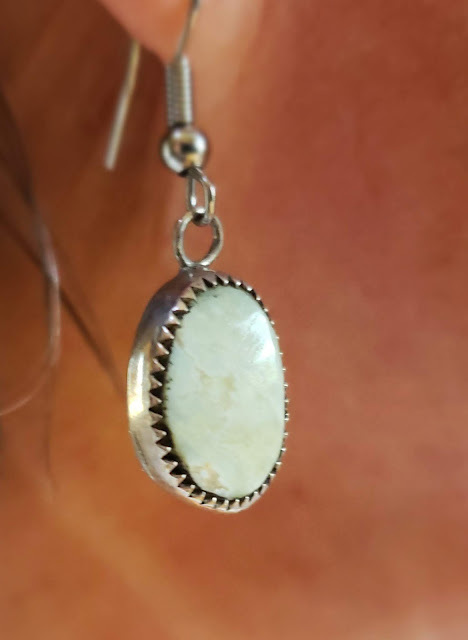 Above is one of the pair of White Angel Cerrillos earrings. 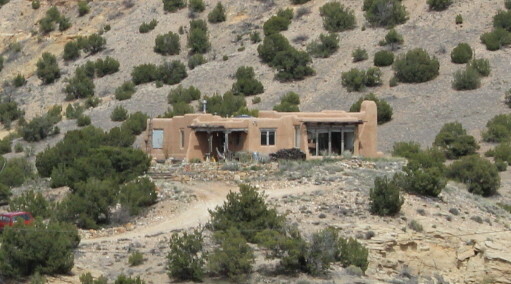 Cerrillos is just outside of Madrid, New Mexico. 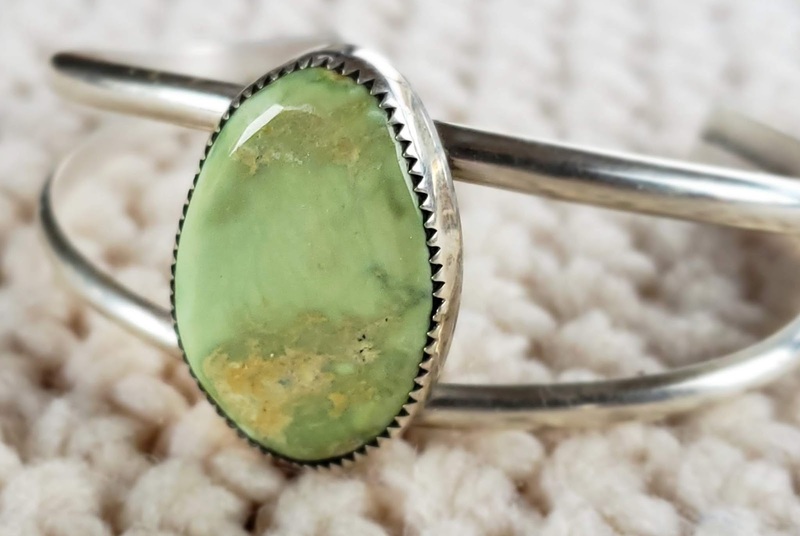 Cerrillos Turquoise on Sterling Silver bracelet. I love the colors and patterns in the stones. 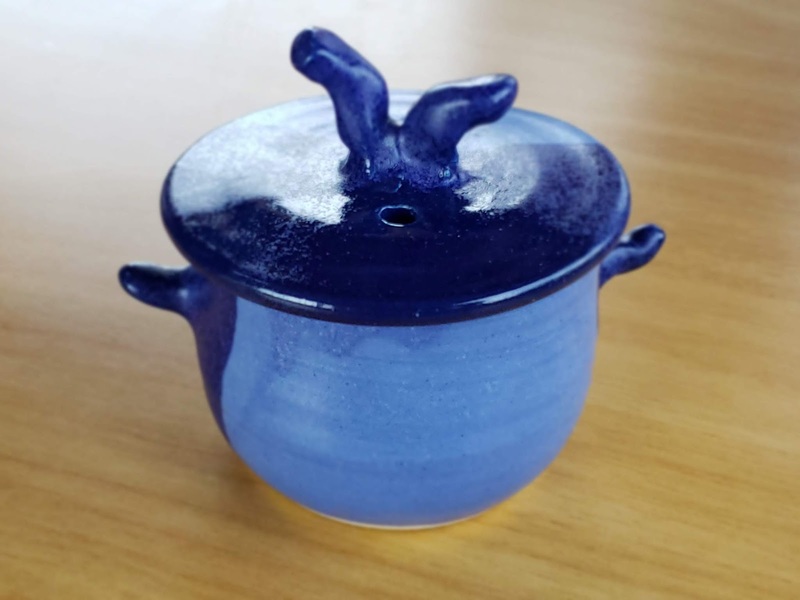 The following is a link to information on Cerrillos Turquoise. Scrolling down the page will show that there are many colors in Cerrillos Turquoise from light tan and white, to shades of green. A sign at the Hollar restaurant. How about that beer from the Tractor Brewing Company? A larger restaurant and seemingly quite popular. This in town house appears to be definitely occupied. The porch does lean a bit and no---it is not for sale. Heading west towards Route 25 and Santa Fe. The adobe look fits right in. Also the current green look around Arizona and New Mexico. We counted 24 solar panels. 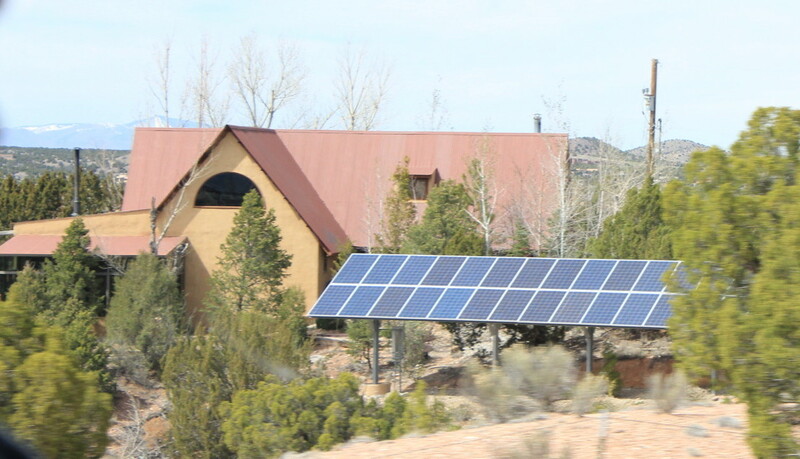 And remember, New Mexico has lots and lots of sunshine during the year. At Route 25, we head south a bit to Route 16 towards Pena Blanca. 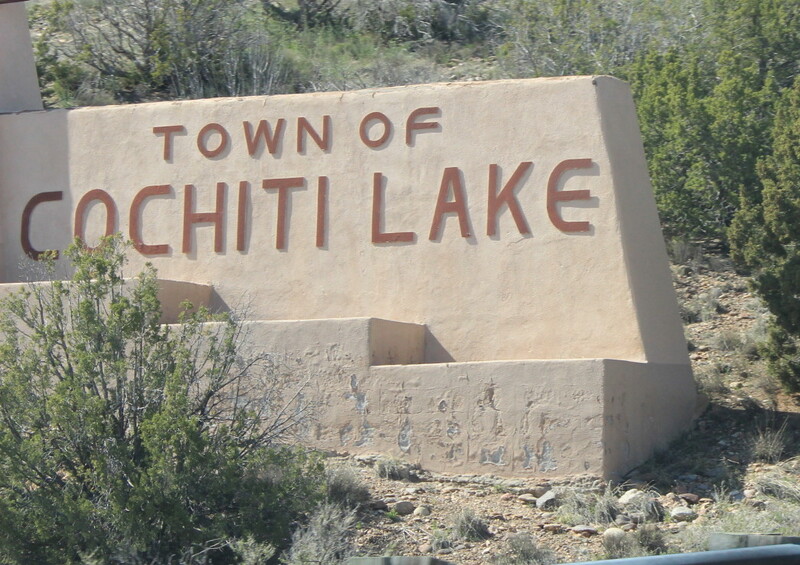 Then to Route 22 for Cochiti Lake Corps of Engineer Campground. The lake down behind and wonderful views all around. ANSWER to the picture from Conley Studio in Madrid. 30 seconds with just a little olive oil coating.